Since December 2011, all the children have been living at Casa Padre Wasson in Jinotepe. 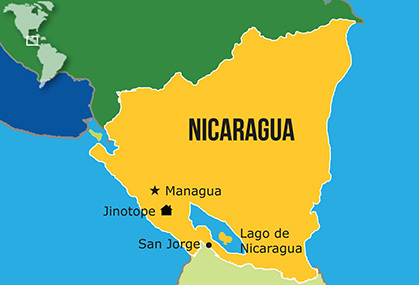 Prior to that, children under age 7 lived in San Jorge, and the rest on Ometepe Island. An earthquake and volcanic activity on the island caused a temporary evacuation of the home in August 2005, and due to ongoing safety concerns, new property was acquired and all of the children from both sites were eventually relocated. The National Director is an hermano mayor (“older brother”), who was raised at NPH Honduras. A folkloric dance and music group performs locally and in the U.S. The farms have a variety of fruits and vegetables, as well as chickens, cows, fish and pigs. The hope is to achieve self-sufficiency in basic grains and dairy products in 2017. The wastewater treatment system works without electricity or chemicals and the treated water can be used for irrigation of green areas, gardens and agricultural programs. In 2017, approximately 500 solar panels were installed on the rooftops of the vocational workshops and the cafeteria. It is expected that this will save the home up to 30% in energy costs, or nearly $2,000 per month, and puts NPH at the forefront of sustainable, solar energy in Nicaragua. The Samaritan Project at Casa Samaritano on Ometepe Island and at Casa Padre Wasson provides occupational and physical therapy, psychological care, and medical exams to children in the community. The vocational workshops went through a certification and accreditation process in 2015. Students can now be certified in shoe-making, sewing, residential electricity, welding, computation, and English. Construction of the secondary school was completed in 2017. It includes eight classrooms, a lab and a library. In 2018, a tutoring program was developed for community students who could not travel to school because of civil unrest.